When referring to Pilot Mountain Turquoise most people refer to Turquoise from the Troy Springs Turquoise and Montezuma Turquoise claims now generally called "Pilot Mountain mine". 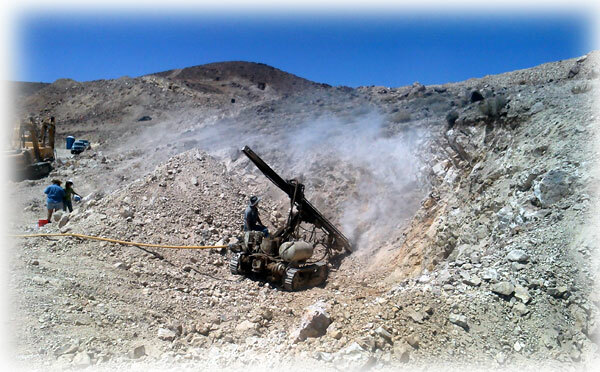 The Pilot Mountain Turquoise Mine is located in western Nevada. It first began as a copper mine. 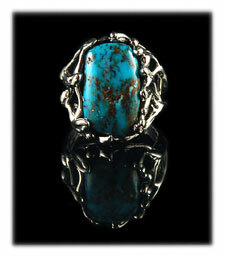 Soon after it was realized that the Turquoise found there was extremely high quality and more fertile than the copper. Copper mining ceased and the mine was claimed for mining Turquoise instead. Pilot Mountain Turquoise is known world wide for it vast array of colors and quality. William Miller of Tonopah discovered the Montezuma in 1905. Today these claims are owned by several different families. The two main families working the Pilot Mountain mines are the Wilson and the Cordova Families of Colorado. This Nevada mine is one of the gem mines made famous for its extremely rare ability to form dendrites (manganese plant fossil replacements) in the Turquoise. The Pilot Mountain mine also produces some very high grade spiderweb stones, with interesting web matrix patterns that include red, brown, and black colors. It is a hard stone and so it takes a good shine that retains color longer and is resistant to skin oils. The Pilot Mountain claims produce Turquoise that looks like other famous mines, especially the Royston Turquoise mine, however, most of the material from the Pilot Mountain mine is very unique and easy to pick out from cabochons cut from stone mined elsewhere. Above is the equipment it takes to mine the Pilot Mountain mines (Montezuma and Troy Springs mines) - Courtesy of Wilson Family. 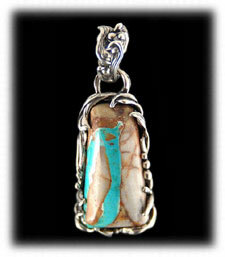 Some of the finest Turquoise Jewelry on the market today and in the yesteryear has been made with high grade Pilot Mountain Turquoise from Nevada. You will see many fine works of art made by the Hartman family and our Native American silversmith friends created from natural Pilot Mountain Turquoise. We love all colors and looks of natural Pilot Mountain Turquoise. 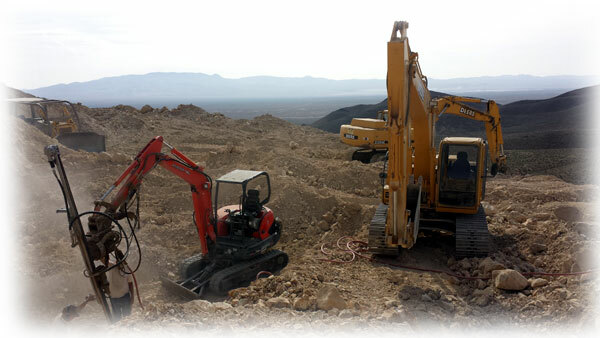 We have connections to all the miners in Nevada and are proud to represent the fine natural American Turquoisethey are mining today. 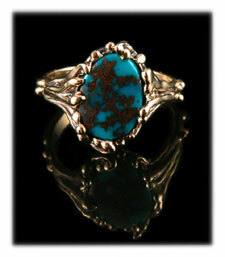 We also buy old collections of American Turquoise which we using our hand crafted gold and silver jewelry. 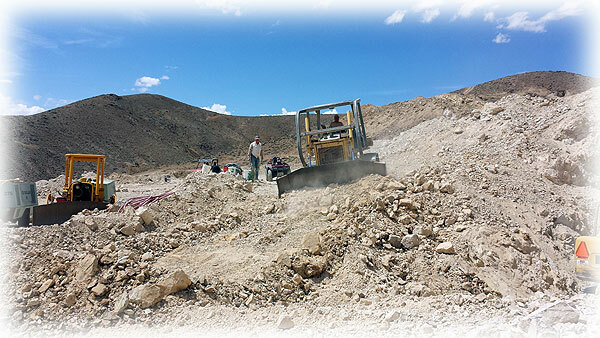 To the top right you can see a fine example of natural, top gem grade, deep bluePilot Mountain Turquoise that is being mined by the Wilson family of Colorado. 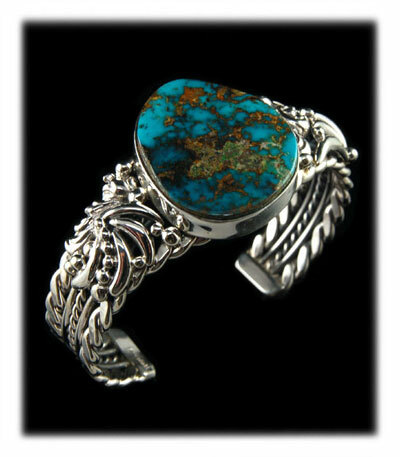 John Hartman created this handmade Sterling Silver cuff bracelet with Pilot Mountain Turquoise. To the bottom right you can see a great example of the gem blue to green fade Pilot Mountain Turquoise that the Cordova family is pulling out of their claims. John Hartman created this handmade Sterling Silver pendant with Pilot Mountain Turquoise. 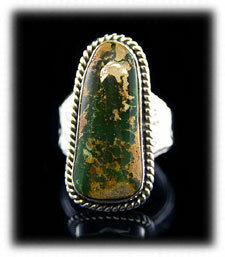 Above is a Sterling Silver ring by Crystal Hartman with Pilot Mountain Turquoise from an old collection. Just in these three piece you can see a variety of matrix patterns and color ranges that the Pilot Mines produce. Above to the left is a handmade Sterling Silver and military green Pilot Mountain Turquoise ring by John Hartman. This stone was cut from material that John and Dillon Hartman mined many years ago. Above in the center is a top gem grade cabochon of natural Pilot Mountain Turquoise set in 14k gold by Nattarika Hartman. This fine piece of Pilot Mountain Turquoise came from an old collection. 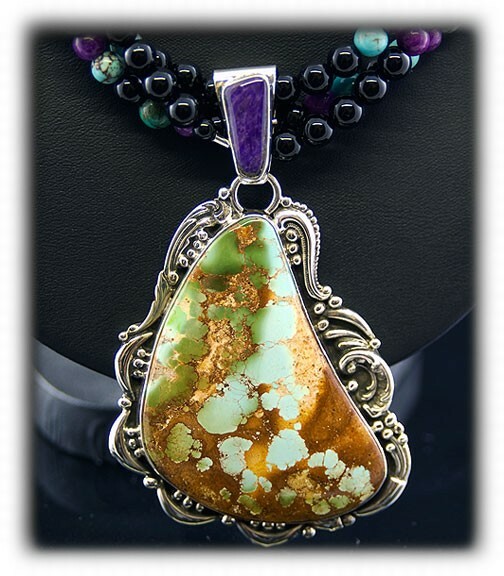 Above to the right is silver amulet by Crystal Hartman with a "Boulder Turquoise" or "Ribbon Turquoise" from the Pilot mines. All of these Nevada Turquoise cabochons were cut by Dillon and John Hartman. 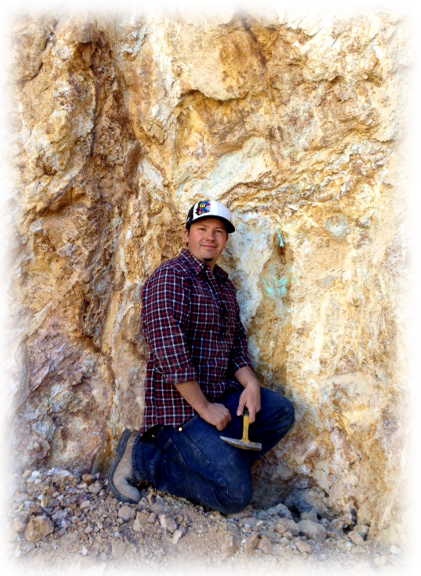 Above is a picture of Dillon Hartman at the Pilot Mountain Turquoise mines next to a vein of Blue Turquoise. The Pilot Mountain Turquoise district is located along the southern slopes of the Pilot Mountain range, about 30 miles east of Mina, Nevada in Mineral County, near the border with Esmerelda. The first discoveries were made in the area in 1908, but a number have been made since. In addition to the mines below, the High Blue area is also along the south side of the Pilot Range, about 5 miles west of the Blue Eagle area. Most of the turquoise from the Pilot Mountain district is found in vein form. Pilot Mountain - The Pilot Mountain mine is one of Nevada's more productive turquoise mines. 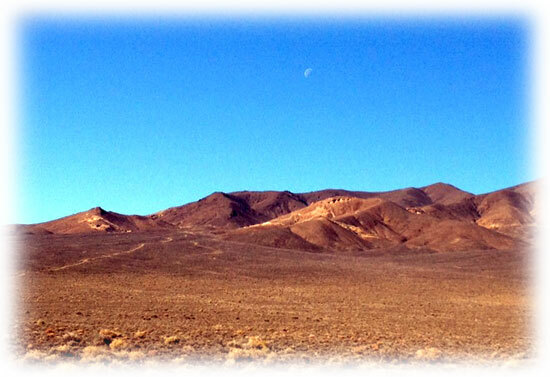 It is located in Mineral County in west-central Nevada east of the town of Mina. Originally discovered in 1908, and worked as the Montezuma or Troy Springs mine, it was heavily worked by bulldozer in the 1970s, by a series of small open pits and was very productive at that time. It continues producing on a small scale - the work being accomplished by one family. The stone is highly admired for its deep blue-green colors. In addition, it can show light blue to dark green colors on the same stone. This graduation in color is unusual and makes theturquoise very collectible. The matrix is black to golden brown. Pilot Mountain Turquoise is a hard stone and takes a good polish. The Montezuma is still being worked two or three times a year and produces a hard thin veined turquoise with colors ranging from a bright blue to dark blue, along with a dark blue with a greenish cast. Light to dark brown limonite mottled patterns are associated with this material. William Miller of Tonopah discovered the Montezuma in 1905. Moqui-Aztec - The Moqui-Aztec mine was a turquoise occurrence near the pilot Mountain mine, about 1.5 miles west of Troy Springs. It was worked many years ago, and has not produced much since. Turquoise Bonanza - The Turquoise Bonanza mine is located on the west side of Pilot Mountain about 2.5 miles north of the Pilot Mountain mine in Mineral County in west-central Nevada and east of the town of Mina. The first discovery here was made in 1908, but significant mining did not begin until 1943. Ted Johnson and others did considerable work mining here from the 1950s through the 1970s. Total turquoise production is estimated at about $400,000 worth of rough. The mine has produced a wide range colors, including blue, blue-green and green. The turquoise occurs in veins up to 2 inches wide in an altered, fractured quartzite. Much of the vein or slab material has an attractive matrix pattern, and spiderweb material does occur here. Nuggets of turquoise are rare at this location. The turquoise is hard, of good quality, and takes a good polish. There are more than 20 individual deposits on the property and each contains a distinct variety of turquoise. Above is a picture of the Wilson family mining with a track drill. Blue Eagle - The Blue Eagle area is located about 2 miles west of the Pilot Mountain mine. A series of moderate sized open pit excavations were worked by bulldozer during the period of high turquoise demand in the 1960s and 1970s. The area was little worked before that time. One of the Mines here produced very unusual turquoise pseudomorphs where the material assumes the form of another mineral crystal (usually apatite). The Blue Eagle mine had recently been re-claimed by the Otteson family and is being worked today. The Blue Eagle mine is producing beautiful blue nuggets the resemble Arizona Turquoise. Blue Bird Turquoise Mine - The Blue Bird mine is located SE of Mina Nevada in the Pilot Mountain range. This small mine was owned by Frank Clark and worked by Doyle Brannon in the 1970s. The Blue Bird Turquoise mine is one of the most majestic spots in the Pilot Mountains. This mine produced some beautiful Turquoise or exceptional quality. Some of the deep blue Turquoise from the Blue Bird mine is similar to Candelaria and Bisbee in color and red matrix. This mine also produced beautiful hard blue green Turquoise. The Blue Birde #1 had recently been re-claimed by Robert Otteson and named Cora Lee Turquoise mine. High Blue Turquoise Mine - The High Blue Turquoise mine is another small claim that was owned by Doyle Brannon. This small Turquoise mine is located high up in a saddle between two peaks. This is one of the hardest mines to get to, but it is well worth the climb. The High Blue Turquoise mine produced some deep blue Turquoise with red spiderweb matrix that is only rivaled by the best Candelaria or Bisbee Turquoise. This mine has been re-claimed by the Otteson family and is slated to be re-opened in the near future. Poor Sam Turquoise Mine - The Poor Sam Turquoise mine is a tiny mine that was barely worked during the Turquoise boom of the 1970s. This mine is located approx 2 miles NE of the Blue Bird Turquoise mine on top of a small foot hill. This mine was re-claimed in 2013 by the Young family and is currently being re-worked. The Poor Sam Turquoise mine produced a beautiful light blue to medium blue Turquoise. The Halley's Comet Mine is located near to the Pilot Mountain area at the southern end of the Excelsior Range about 10 miles SW of Mina. 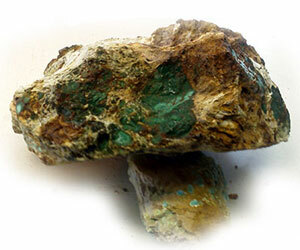 It has produced a small amount of both varicite and turquoise, much of the material is very bright green in color. The Halley's Comet Turquoise mine was named after the unique Turquoise there that has gray agate inclusions which are usually in a triangular shape and scattered through the Turquoise like the tail of a comet. This mine is currently owned by Nevada Turquoise Company. Above the Wilson family mines with bulldozers. 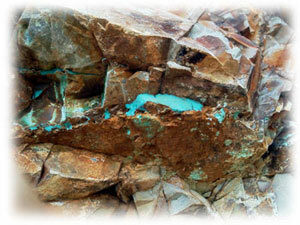 Thank you for taking a look at our page on Pilot Mountain Turquoise.